Have you talked to a robot today? It’s likely you have. You might have asked Alexa for a weather report, or told Siri to call your spouse. Or you might have chatted with an algorithmic customer support specialist on a website or over a messaging app. These artificially intelligent companions are always on, always listening, always ready to help. They’re almost everything people want from a customer support experience. So, it’s tempting to think that the next level of customer support will be entirely bot-driven: Chatbots, digital assistants, and the like. The right tools can help your customer support representatives be more efficient and provide more value. 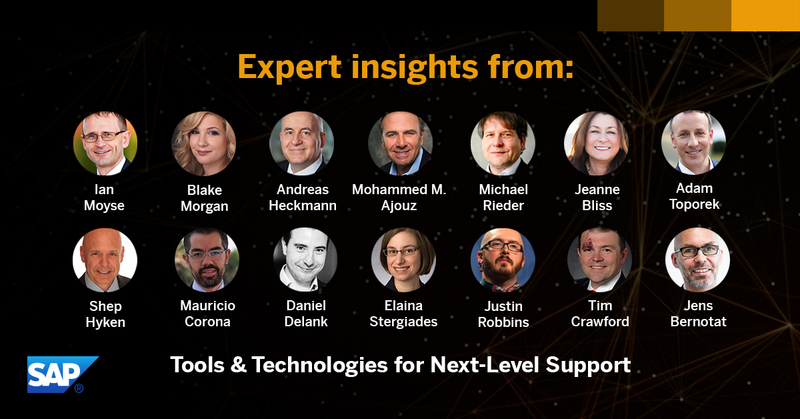 For this episode of the SAP Customer Support Podcast, we asked key industry experts to share the tools and technologies that will enable the next level of customer support. These thought leaders agree that artificial intelligence and automation both have a role to play in meeting customer expectation, but the human element will be a vital part of the solution as well. Listen now to hear how your business can prepare for the next evolution in customer support. Jeanne Bliss, Chief Customer Officer, Keynote Speaker, Executive Advisor, and Co-founder at CXPA.org, shares how businesses can use technology to promote human-to-human connection. Blake Morgan, Customer Experience Futurist, Author and Speaker, highlights the top priority your business should invest in for customer support. Jens Bernotat, Global Vice President, Support Portfolio at SAP, explains how businesses need to redefine the goal of customer support to take it to the next level. Download the episode now for these insights and more from our expert panel. The next level of customer support is proactive. Tools and technology can empower your support representatives to anticipate potential problems and solve them before the customer is even aware there’s an issue. But the future of support is also omni-channel, connecting with customers wherever they want to reach out. Technology can automate low-level interactions, freeing your agents to handle the issues that genuinely require a human touch.